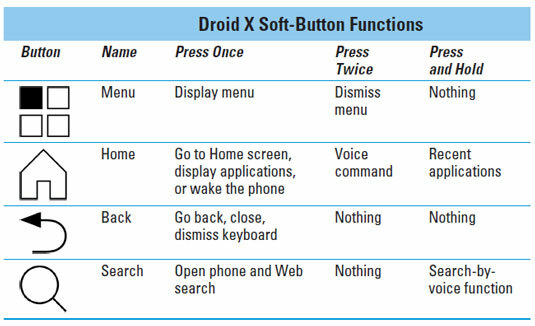 The Droid X is most likely different from any other phone you’ve owned. Your Droid has soft buttons that you use to perform specific functions, and you work with the touchscreen to navigate your phone’s contents. Below the touchscreen are four buttons labeled with four icons. These so-called soft buttons perform specific functions, no matter what you’re doing with the phone. This table lists the soft-button functions. Pressing the Home soft button always takes you to the main Home screen, unless you’re already viewing the main Home screen, in which case pressing the Home soft button displays the Application Tray. Touch: In this simple operation, you touch the screen. Generally, you’re touching an object, such as a program icon or a button, or a control such as a gizmo you use to slide something around. Double-tap: Touch the screen in the same location twice. You can double-tap to zoom in on an image or a map, but you can also zoom out in the same way. Because of the double-tap’s dual nature, you may want to use the pinch or spread operation, instead. The long press: Touch and hold part of the screen. Some operations on the Droid X, such as moving an icon on the Home screen, begin with a long press. Swipe: When you swipe, you start with your finger in one spot and then drag it to another spot. Usually, swipes are up, down, left, or right, which moves material displayed in the direction you swipe your finger. Swipes can be fast, flick-like actions, or they can be slow. This operation is also known as a flick. Pinch: A pinch involves two fingers, which start out separated and then are brought together. The effect is used to reduce an image or zoom out of a map. Spread: In the opposite of a pinch, you start out with your fingers together and then spread them. The spread is used to zoom in. You can’t use the touchscreen while you’re wearing gloves, unless they’re gloves specially designed for using an electronic touchscreen.